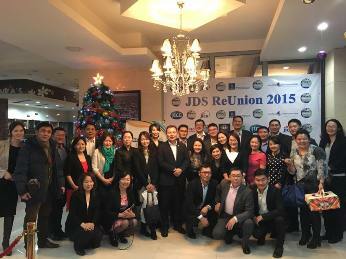 On December 11, 2015, graduates of the Project for Human Resource Development Scholarship by Japanese Grant Aid (JDS) established the JDS Alumni Association in Mongolia. An opening ceremony was held in Ulaanbaatar, which was attended by JDS Alumni, representatives from the Japanese University Graduates Association of Mongolia (JUGAMO), the Japan International Cooperation Agency (JICA) Alumni Association Mongolia and the Japanese Chamber of Commerce and Industry in Mongolia. The celebration featured the Alumni’s experience under the JDS program and how it has successfully enriched their lives as young leaders in their country. The ceremony concluded with the signing of a Memorandum of Understanding between the newly established JDS Alumni Association Mongolia, JICA and JICE. 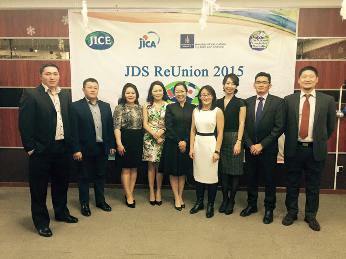 While JICA and JICE will provide initial support for the conduct of the Alumni activities, the JDS Alumni Association of Mongolia promises to strengthen their network and sustainably continue alumni activities. The JDS Program was established in 1999 to support highly capable young leaders from developing countries by offering scholarships for Master’s course in selected Japanese Universities. The JDS program has since provided scholarships to more than 3,000 fellows from 13 countries. The JDS program in Mongolia started in 2001 and has provided scholarships to a total of 262 young leaders from Mongolia as of February 2016. JICE, as an agent of partner countries has supported these young leaders to pursue a Master’s degree in Japan and contribute to the socio-economic development of their home country. The JDS Alumni volunteers who organized the successful event. 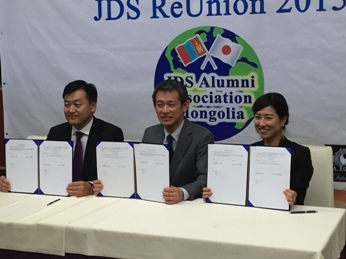 JDS Alumni Association Mongolia, JICA and JICE sign the Memorandum of Understanding.